When most people think of the opioid crisis raging in America right now, they might think about drugs with common names, like heroin and oxycodone. But recent statistics would suggest that not only is there a more potent drug out there, but it is the leading cause of modern opiate overdoses and deaths. This drug is fentanyl- a synthetic pain reliever that works extremely rapidly to alleviate pain or injury in the body. This drug is actually legal- used for chronic cancer pain, but it’s coming in increasingly potent forms. While it is administered in a patch in most legal, medical settings, fentanyl is coming from overseas in powder that has been found to be 50 to 100 times more potent than heroin or morphine. This makes the mortality rate of fentanyl atrocious. The drug is now ubiquitous in street culture, it has flooded American drug markets as street dealers and international cartels work together to make fentanyl the catalyst for further opioid crisis and addiction in America. So why did fentanyl start being used anyway? Well, it was originally created as an anesthetic, but pretty soon after people started discovering its painkilling properties. For this reason, it was a good bet for a post-surgery painkiller or for use in other extreme pain scenarios. Because of this use and connotation, it is now widely regarded as one of the most potent opioids out there. So what is the chemical reasoning behind the difference in potency? 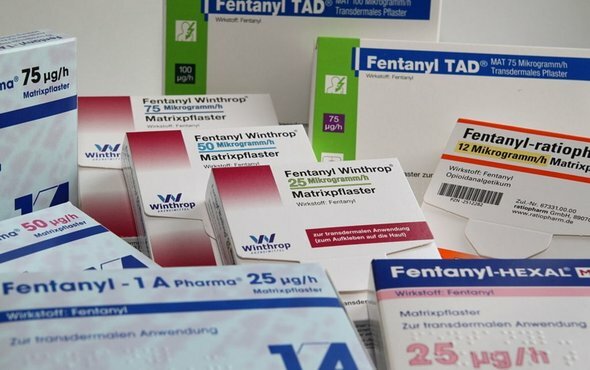 Does fentanyl not work like other opiates such as morphine or oxycodone? Well, it does act on the same receptors in the brain as other painkillers, it simply reaches the brain’s opioid receptors faster than other drugs, and thus creates a habit-forming high. While fentanyl’s strength is a great plus to the street dealers, who profit off the drug’s connotation and popularity, it does a great deal of damage to the user, even if the user never intended to buy fentanyl. Street-grade heroin is being cut with fentanyl at an alarming rate, meaning some users thought they were buying pure heroin when in fact it was a cocktail of even deadlier chemicals. Furthermore, pills are being pressed with fentanyl and sold to users under the auspice of being painkillers like oxycodone or hydrocodone, or even in some cases, benzodiazepines like Xanax. However, there are certainly some users who go out seeking fentanyl. Or there are those users that were hooked after buying what they later found (or never found out) was fentanyl. The drug has heightened sensations and translates into full-blown addiction at an alarming rate, even fast among the notoriously addictive opioid family. Fentanyl overdoses are an unfortunately common result of fentanyl use. Even the smallest amount can leave the user dead. It has also been reported by the CDC that in fentanyl-related overdoses and death, there is usually an illicit version of the drug being used, often mixed with heroin or cocaine. The DEA even issued a national alert that called fentanyl a threat to the public’s health and general safety, back in 2015. However, things just keep getting worse. Fentanyl is so dangerous because the line between the desired, euphoric high and death is so, so thin. In some states, accidental deaths due to fentanyl are surpassing those attributed to heroin use and abuse. If you can picture, an amount of fentanyl similar in size to two grains of salt could kill the average, adult female. If the user survives the overdose, long-term side effects are still possible. That is why someone undergoing any overdose symptoms needs to be admitted and receive medical help as soon as possible. Perhaps one of the most dangerous possibilities from overdose is respiratory depression (not being able to breathe), which can lead to hypoxia and can result in long-lasting brain damage. If someone you know, or you yourself have overdosed, that marks a necessary time to get treatment. Of course, emergency medical attention is what you will be first thinking about. In that case, you will want to consider Naloxone, which goes by the brand name Narcan, and can reverse the effects of an opioid overdose. However, the drug is not as effective with fentanyl as with heroin. However, after the initial medical procedures, you will want to consider long-term treatment to aid in the recovery process. Drug addiction usually entails detox from fentanyl or other drugs and then a stay in a longer-term center. When choosing a detox or rehab, it is important to find a center with both compassion and expertise. Allure Detox is a gem in the addiction treatment industry, and can help individuals addicted to fentanyl, among other drugs.